WJSG Internet Radio: Buying, streaming, and storing your music: One place to do it all? 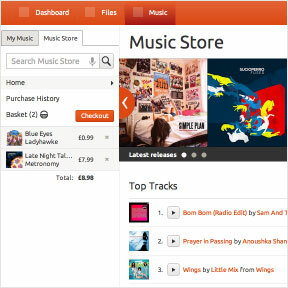 Buying, streaming, and storing your music: One place to do it all? I don't have a monster music collection, but I do have something close to 1,000 songs out there on different storage drives and music stores. I also am a fan of subscription music services that let me experience various genres and enjoy new music choices. As a fairly mobile OS agnostic person I have purchased music from several different services in the past and am now on a mission to bring everything together and simplify my mobile music practices. There are several solutions available and the service that is best for you is highly dependent on the mobile device and operating system you use. I have found one service that does it ALL, but it is currently limited to a single mobile device. Amazon's MP3 store offers some of the absolute best deals for purchasing music and I have purchased my fair share of their $5 album deals. They have over 20 million songs in their collection. Amazon lets you upload 250 of your own, unmatched songs for free so you can use Amazon as a storage locker for a limited collection. Songs you purchase from Amazon do not count against the number you upload. You can also pay $24.99 per year and store up to 250,000 songs. That is an extremely generous number of songs and I think you would definitely have to be a music afficionado to need space for that many songs. Amazon has no radio functionality so you will have to discover music manually and purchase it to listen to full songs. Amazon will attempt to play back music in 256 Kbps audio quality. There are mobile applications for Android, Kindle Fire, iOS, Sonos, and PC/Mac computers. There is also a report that a Windows Phone client is coming soon. Apple has a pretty compelling client with iTunes Match and if you are a user of Apple services then it is probably your best choice. For just $24.99 per year you can upload up to 25,000 unmatched songs to Apple. Songs purchased from iTunes do not count against your 25,000 song limit. Apple was the first to provide the matching service, Amazon now has this as well, where songs in your personal collection that are in the iTunes Store (more than 26 million in their collection) will not be uploaded and instead will be provided to you for your listening pleasure. You can use iTunes Match on up to 10 devices and can also choose to download songs to enjoy when you do not have a network connection. Apple TV only streams songs so no downloads are supported on this device. All music is played back at 256 Kbps AAC DRM-free quality, even if the original copy was lower in quality. Google is expanding their ecosystem support and Google Play Music is a fairly powerful service that is provided for FREE. You can upload and store up to 20,000 songs on Google and shop for music in the Google Play Store. You can even share your music and your buddy can listen to the song once. Like most of these services, there is no radio/discover functionality in Google Play Music. The service works with Android devices and there are third party clients for other mobile operating systems. gMusic looks like the best iOS application while Gooroovster looks pretty good on Windows Phone. I recently wrote about the brand new Samsung Music Hub service for Galaxy S III devices and after using it over the past couple of weeks I have to say it is probably the perfect mobile music model to emulate. Samsung Music Hub provides a storage locker, music store, AND radio/discovery option in a single service. You can even play music stored on your SD card right from within the Hub. The storage locker provides support for storing up to 100GB of non-matched songs (equates to about 60,000 songs). The Samsung Music Hub store is provided by 7digital and the great thing is that songs purchased on other devices or through the 7digital website appear in your Samsung Music Hub history. To use the features of Samsung Music Hub you have to pay $9.99 per month and are limited to using it on just the Samsung Galaxy S III. What service is best for you? The only service above that supports radio/music discovery is Samsung Music Hub. You can always use one of the streaming music services that are priced about $10/month. I personally would love to see Spotify, Rdio, Slacker, or one of these streaming/discovery services develop a partnership with one of the storage locker/store services to create a service similar to the Samsung Music Hub, but available on more than a single device. In my opinion, if you use iOS devices then iTunes Match plus a streaming service (like Spotify) is probably the best strategy. Android users will likely want to go with Amazon (lowest song prices) or Google Play (free service) combined with a streaming service. Windows Phone users may want to use Google Play for the free locker service and then go with the free Nokia Music service, if available on your device, or Zune Pass subscription for streaming and discovery. Do you have a preferred service or two that you use with your mobile device?